Brendan Bjorn has been home from the hospital for 7 days now. It’s only been 2 days, though, that his body has been able to accept full strength formula at the normal pump rate. It’s also 7 days now that he’s been bedridden in an attempt to get the pressure sore to heal before he can again sit in his wheelchair. It is healing, albeit slowly. As for me, I’ve been house-bound for 7 days now. I think many people tend to forget about that part of our journey. They don’t think about what that does to me or my mental health. And what about my 9 year old son Declan? All he’s seen the past 7 days is his school and home. I sometimes think, at least he gets to go out for a bike ride to school and back. It isn’t enough for Declan, and it isn’t enough for me. We did actually get out for an hour a couple of days ago. We went to look at a rental home. Not just any rental home, this one was a bungalow with all the bedrooms and a bathroom on the ground floor. For a family with disability, this is an amazing find. A new start with a long term 3 year HAP lease. They even suggested putting in a cement ramp at the front step for Brendan. I was over the moon. Declan and I walked around the house – our second visit to the home – and decided where his bed would go, where this and that would go. We walked around the neighbourhood and saw all the local kids playing who could become his new friends. We drove home looking forward to our future…finally. Later that evening I took out the lease to look it over and sign it. Tucked away on the tenth page of the 19-page lease was one sentence that killed all we looked forward to: “Unless the Landlord previously approves in writing, not to keep any pets in the property.” My heart sank. I re-read it. Ok, I thought, it sounds like I might just need the written approval first. I grabbed my mobile and texted the owner…and waited anxiously for the reply. It was a no. A flat out, unbending, no. I pleaded. I offered more deposit money. Again, no. And with that, we lost only the second bungalow rental we’ve been able to find. I of course had to have a talk with Declan. The first thing he asked when I told him the news was why the owner hated us. I explained it wasn’t us, it was just that they don’t want our pets in the house. The next thing he said was that he wasn’t getting rid of his cat, who indeed was lying there next to him on his bed. He had tears in his eyes. No baby, you’re not getting rid of your cat. It has been a very long 7 days stuck inside a house. There is a book’s worth of information that could be written about the strains on emotional and mental health that result from all the challenges that come with this journey of having a child who is severely disabled, very medically fragile, and palliative with a complex life-limiting condition. I’ve covered some of those issues in previous blogs: Depression, anxiety, loneliness from social isolation, and diminished sense of self-worth from having to leave one’s professional career behind to become a full time carer. These are just some of the main challenges family carers like me face on a daily basis. There is plenty that people outside of this journey don’t understand. One of those very important, and seemingly not understood, aspects is this emotional rollercoaster that families like mine are on. We are often hurting. We are often depressed or filled with anxiety. We are often grieving – grieving a life we aren’t equally free to live and, for me and Declan, grieving what we know will be the loss of our most beloved Brendan Bjorn. 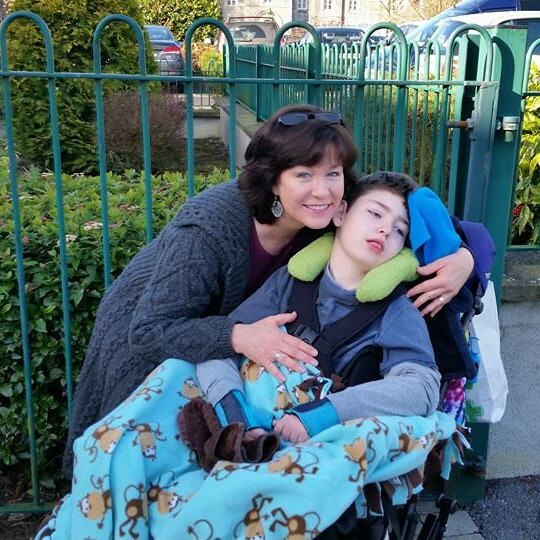 Last week when Brendan Bjorn came home from hospital, I had a heart-to-heart talk with Declan. I asked him what his wishes are for when it looks like “that day” for his brother comes. Can you imagine having to talk to your 9 year old child about the impending death of his big brother? Let me tell you, it is gut wrenching. This is the nature of our relationship, though, me and Declan, and he took it well and held my hand as we both cried. Yes, he absolutely wants to be there if he can. Yes, we don’t want it to happen for many years to come. We are a strong little family, me and my two sons. This morning before school, Declan randomly went up to his cat, Magni, who was curled up in a ball asleep on the couch, and he said, “I love you, Magni. You’re not going anywhere, don’t you worry.” And with that, it all came flooding to me: We need these pets. Magni is Declan’s rock, his soft place to fall, his friend when no one else is around. And my dog, Thor, is the exact same for me, as well as being the guardian of the house who makes us all feel safe. No, they won’t be going anywhere, Declan, don’t you worry. We need them as much as they need us. It’s been 7 days you might not understand.